Rather be Birdfeeding White T-Shirt - I'd rather be Birdfeeding license plate holders, t-shirts, stickers and gifts those who would rather be doing something else. 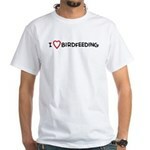 I Love Birdfeeding White T-Shirt - I Heart and Love Birdfeeding. Get this unique heart design on t-shirts, tees, stickers or gifts.